There is a misconception out in the world that A level PE is an easy subject! Yet those who have actually experienced the course will most certainly beg to differ! Whenever I hear things on the news or mis- informed parents de-valuing or dismissing it as an easy option I just wish they could have been part of the A level mountain bike assessment or part of the numerous training sessions that students have to undertake to even make band 3 on the assessment criteria. That's before students have to undertake an exam that requires skills tested in science, english and psychology! However when it boils down to it those who take pleasure in thinking it is an easy option usually have had a bad experience in sport or were just plain useless at it! Mountain biking is a strong element in our school with a club that is growing from strength to strength. The highlight of the year was riding all 7 Stanes mountain bike routes in 24 hours (a later blog post) and watching the Tour de France whilst on a cycling trip (another later blog post). Out of the club we are getting more and more talented riders selecting mountain biking for both A level and GCSE PE assessment. The criteria for mountain biking A2 level PE is below and it is easy to see why this is no easy option! So the route was planned to leave High Tilberthwaite and head for Coniston on the cycle way. For March the weather was fantastic! Climbing out of Coniston to Lawson Park was spectacular with the early morning light showing the best the area has to offer! The view over the lake was stunning as we headed towards Low Parkamoor and one of the best descents in the lakes! We could see our return route clearly over Walna Scar road high above Coniston Water. The descent was interrupted by a few 4x4 vehicles venturing up but this was just another chapter of risk assessing that the student can add into the extensive logbook they must complete. The descent is fantastic and quite technical in places making you really think about your line. Another difficulty is not being distracted by the fantastic view all around! 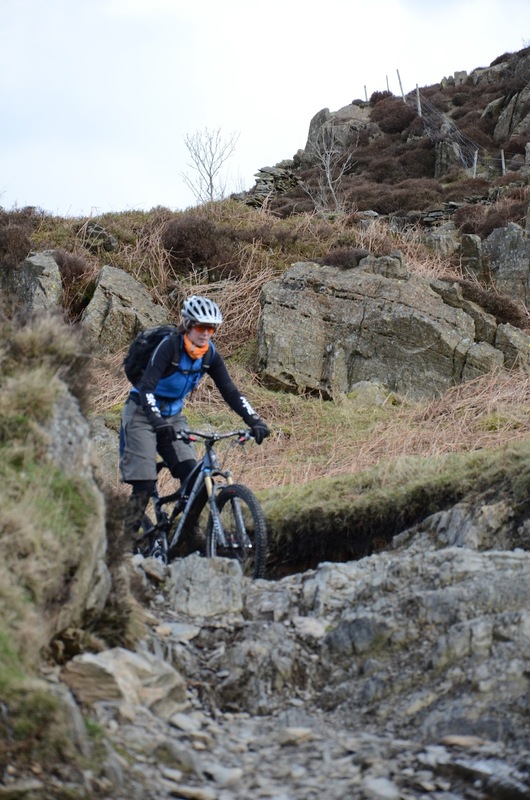 The route comes out at High Nibthwaite and weaves its way over to Blawith. The route was on the road to Blawith before climbing out and up towards Appletree Holme. It was time to stop for lunch and discuss the already fantastic riding we had experienced. The route follows an interesting bridleway over to Green Moor. The ascent is fun and interesting and only a slight drag to the top before a great descent to Green Moor and the road. 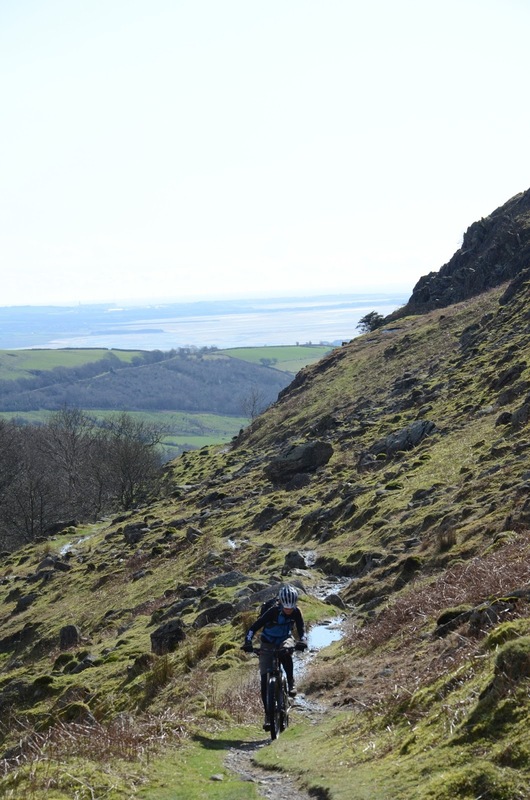 The planned route weaved its way to Broughton Mills and onto Stephenson Ground before climbing over the Dunnerdale Fells to meet the Walna Scar road. The legs were feeling the grassy steep climbs from Stephenson Ground but the views were well worth the effort! There was an option to take the great descent to Seathwaite but we decided to climb and meet the Walna Scar road higher up! This certainly was not the easy option. It is a strange experience being the person who is guided and not the guide especially when it is by one of your students! However we were in very good hands indeed! The climb up Walna Scar looks worse than it actually is! Again lots of the ascents and descents have been sanitised which has in part taken some of the challenge out of the route. There is a real feeling of satisfaction when you reach the top as you know it is downhill all the way to Coniston on a great trail! Once at the bottom we turned left to pick up the cycleway back to High Tilberthwaite. The route and assessment had been a success! High levels of skill were shown throughout the ride whether it was navigation or riding. This was a top band student and had chosen a route to show off every skill! The logbook that followed was degree level and well deserving of the top marks. For those who think this is easy feel free to come on the next assessment but remember this is only a small percentage of the overall mark for the 2 year course!